Please check out the two new papers below from our Geocoastal Research Group (GRG) members. The first paper led by Dr Gustavo Hinestrosa (former GRG PhD student now in London), provides of a comprehensive reconstruction of the evolution of the Great Barrier Reef (GBR) shelf edge during a period of rapidly rising sea level over the last 30,000 to 10,000 years. 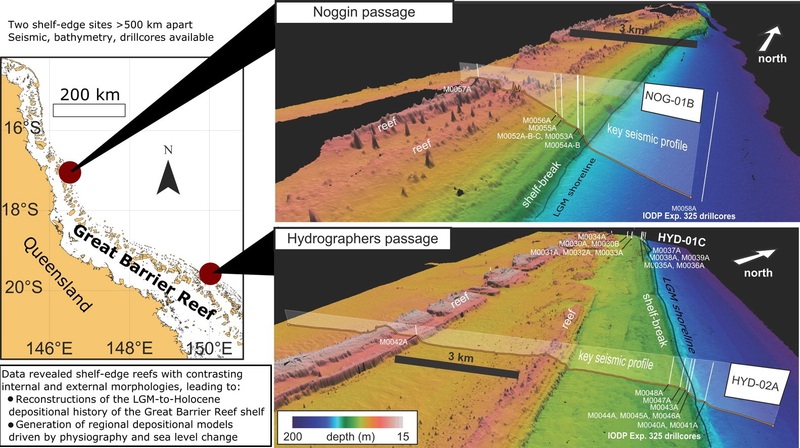 This paper combines high-resolution seismic stratigraphic and Integrated Ocean Discovery Program (IODP) Expedition 325 core data collected from the GBR shelf edge. The second paper from Belinda Dechnik (current GRG PhD student) integrates field, sedimentological and geochronological data (U-series ages) from short cores (<1 m) collected from reefs flats at One Tree and Heron Islands in the southern GBR. These reef flats formed over the last ~ 7,000 years during the Holocene stillstand of sealevel. The paper also includes an innovative meta-analysis of all available published reef flat ages, combined with hydrodynamic exposure modelling, that establishes coherent patterns in lateral reef flat growth along the GBR. Both are excellent papers and really advance the understanding how coral reefs growth in response to rising and stable sea levels, respectively. Congratulations to both Gustavo and Belinda and their numerous national and international collaborators!